Bermudian footballer Aaliyah Nolan scored for her University of North Texas soccer team as they defeated Florida International 2-0. The school’s match report said, “The North Texas soccer team concluded its 2018 home schedule unbeaten after shutting out Florida International 2-0. “The Mean Green [12-1-2, 7-0-1] took a conference-match—high 32 shots in the win and received goals from sophomore Logan Bruffett and senior Aaliyah Nolan on a penalty kick. “With Sunday being the final home game of the year, North Texas honored its six seniors who all earned starts versus the Panthers [0-16-1, 0-8-1]. “The win is this senior class’ 60th in their three-plus years at UNT, making them just the fourth senior class to win 60-plus matches. “In the 81st minute, FIU was whistled for a hand-ball in the box and Nolan stepped up to take it. 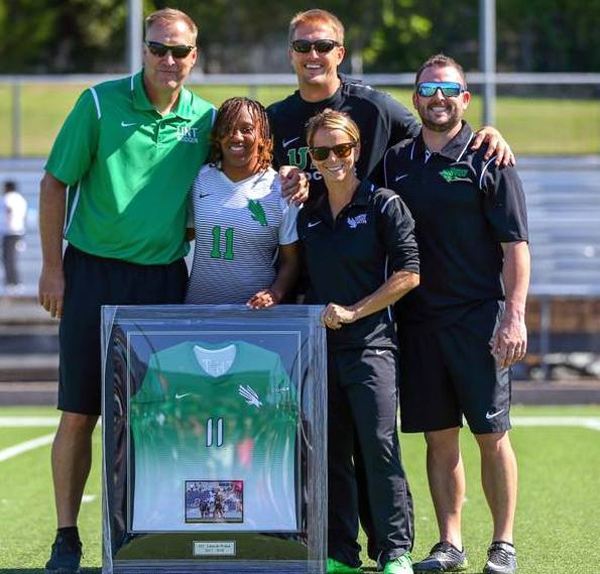 “The Mean Green senior from Bermuda who is the first and only international player in the program’s 24-year history, blistered her shot past the Panthers goalie to give UNT the eventual 2-0 win. “The goal is the Navarro College transfer’s seventh of the year and her 14th UNT career goal. She, fellow senior Taylor Torresand sophomore Berklee Peters lead the team with seven goals each.